Greetings and welcome to Nexus Station Terminal KAR-120C1138! Allow me to introduce myself. I am a Daystrom Computing M-5D Duotronic Computing Device. In other words, I'm the station's computer. But you can call me Sparky. Everyone else does. Now, since you are new here and we're practically pals already, why don't I show you around a bit? Nexus is a pretty big place and you can get lost if you are not careful. But with me by your side -- err.... hand, the only thing you'll ever lose is some time or money. But you can afford it, eh? Anyway, back to my favorite topic -- me! Well, we're talking about the station. But then I AM the station as it were! Now you know why I just love talking about all this! 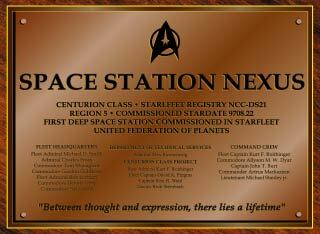 If you want to know a little bit about the Station and its history, just go to fiction section and link to the Nexus Datasheet -- it should have all the info you want or need. Another good resource is our station schematics section. Oh, I know -- you folks like to call them Blueprints. Now, for your convenience and because you are Sparky's special pal, I've put some shortcuts on how to access all this keen stuff how to get where you need to go on the left of your screen. What? You have no shortcuts there? Sheesh! Tell someone to issue you a new personal browser already. Damn budget cuts! It's always us computers who get hit first! Well, that should be just all. No go forth an explore already! What? You ant to know what REALLY goes on here all the time? WELL! What are you, some sort of spook or a member of the press? Oh, who cares. I'd tell you even if you were the devil himself. You've come to the right CPU, let me tell you that. The truth is, I see all and I hear all. Nobody knows what goes on around here quite like I do. Keep in mind that all I'm about to show you is "Fiction" (wink, wink, nudge, nudge) and where you can check the personal logs I wrote during our time in STARFLEET. No one knows the fact I'm immortalizing all their deeds (or lack thereof). If so, I'd get the final boot into the great bitbucket in the sky for sure. So all you read here is 100% pure fiction. None of it ever happened. Really. But we know better, don't we? So what are you waiting for? Dive right in! was a former member of STARFLEET, The International Star Trek Fan Association, Inc.
And was located in their geographic Region 5.